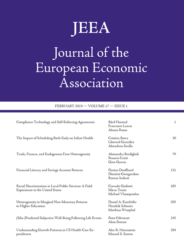 The Journal of the European Economic Association has a worldwide reputation for publishing articles of the highest scientific quality in theoretical and empirical economics for a global audience. Estimates about how people assess their future well-being are the basis of many decisions, which means they are also of economic interest. But how accurate are people in the predictions of their own well-being? It turns out that people tend to make systematic mistakes when predicting their subjective well-being after major life events. We focused on people who had experienced major life events such as marriage, the death of a partner, invalidity, unemployment, separation, or divorce. The results showed that the life events had less of a long-term impact on participant’s satisfaction than they assumed. The examined life events did have a significant impact on the well-being of those affected. Positive events were linked to a strong increase in life satisfaction, and negative events to a strong decrease. However, people overestimate how long the effect of an event continues. The fluctuations in life satisfaction did not last long, but rather swung back completely or partially to the long-term level of previous years. Recently married people, for example, overestimate how happy they will be in five years. In contrast, people underestimate their future life satisfaction after negative events, such losing a job or becoming disabled. There was an exception, however: after separating from a partner, participants estimated the change in their life satisfaction five years later more or less correctly. This runs contrary to the central assumption of economic theory that people can usually predict what will benefit them. The effect of adaptation could contribute to these mispredictions: people do not place enough weight on the idea that they can get used to positive or negative circumstances and adjust to them. Events and new circumstances thereby lose their appeal – or become less burdensome. If people do not take adaptation into account, this likely influences how people make decisions. People would presumably make different decisions if they knew in advance how quickly they could get used to certain altered life circumstances. The risk of misprediction is particularly great if people have to make trade-offs between different areas of life – or between activities and possessions, to which people can adapt very differently. For example, people tend to adapt easily to changes in material goods such as car ownership but less easily to social circumstances such as repeated interaction with friends. Feature image credit: “Bride and groom” by scottwebb. Public domain via Pixabay. Reto Odermatt is a Research Fellow at the Center for Research in Economics and Well-Being at the University of Basel. He conducts applied research using data on subjective well-being in the interdisciplinary field linking economics, psychology, and public policy. Alois Stutzer is a full professor in political economics at the Faculty of Business and Economics, University of Basel. His research interests include political economics, public economics, law and economics, and economics and psychology. They are the authors of "(Mis-)Predicted Subjective Well-Being Following Life Events" published in the Journal of the European Economic Association.